To start a new learning session, click on "New Session". Select the decks you want to practice. For example, the "100 most common characters". Select the session type. 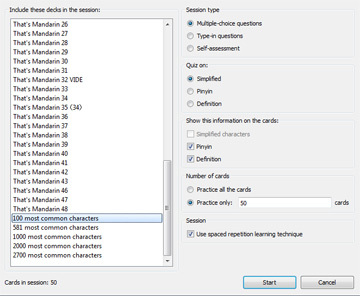 For example, 'multiple-choice questions' (see the help file for more information about the various session types). Select what you would like to be quizzed on. For example, on the simplified characters. Then choose how many cards you'd like to practice. If the deck is small, you might want to practice all the cards. For bigger decks, you can choose a specific number of cards, for example 20 or 30 cards. Finally, click on "Start" to begin the session. 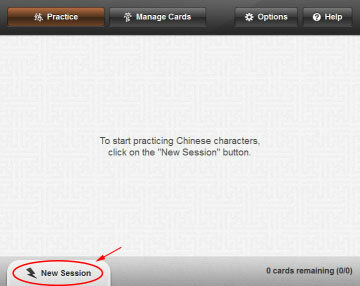 Once the session starts, click on the character that you think matches the definition or pinyin on the card. 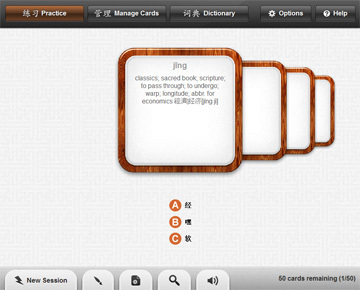 The session will end when there is no more cards to practice; when you start a new session; or simply when you close the software. The result of the sessions is saved automatically for you and used by the spaced repetition algorithm so there is no need to worry about this. Copyright © 2011-2019 Laurent Cozic. All rights reserved.